It’s pretty hard not to have heard of Carcassonne before now. With its huge following, smartphone versions and multiple different games following the same basic theme there’s plenty of options already out there for a Carcassonne fan. So it comes as no surprise to see another new Carcassonne game, with the same tile matching, meeple placing gameplay that we’ve come to know so well, only this time we’ve got a few little tweaks to keep things fresh once again. The big change to all this is in the scoring. Gone is the idea of gaining a bigger score for your roads, towns and whatever else taking up more tiles. Now the number of animals you pass on the way to completing your path or bush is more important, giving more emphasis to the content of the tiles rather than just whether everything matches up. The new savannah themes tiles look great, offering a stark contrast to other games in the series and showing off a wide range of animals as you build up your safari area, and while the various components sit pretty much in line with other games of this ilk, that’s no bad thing – the tiles and meeples are well made and will last well, so there’s little need to mess with the formula. There are elephant meeples for scoring too. They’re pretty cool. Back on the scoring idea, the new way to grab points isn’t necessarily to have huge paths that wind half way round the table, or bushes that cover half the map. These larger elements will help slightly, but it’s not the big deal. As you pass through more different types of animals your points go up, giving you a point for your first animal, 2 more for the 2nd and so on. 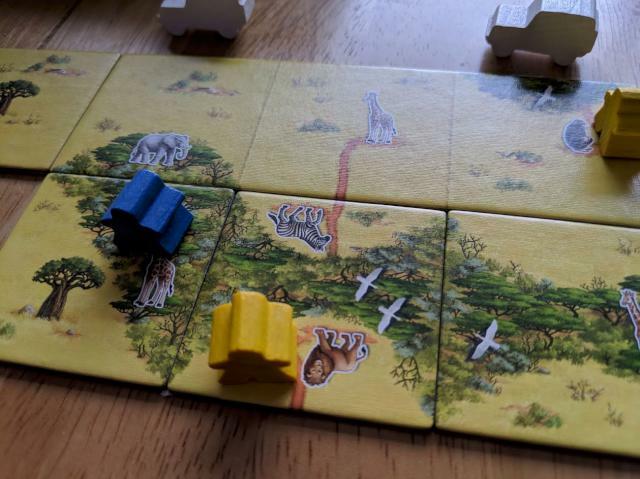 As such the positioning of your tiles has a new layer of strategy involved; there’s no point extending your path if you’re just going to drop another giraffe on a path where you’ve already got one. The bushes are a slightly different idea with birds added into the mix which give you extra points as you build those up, so between the two methods there’s plenty of scope to mix things up a bit. The other main new feature is that of watering holes. At various points in the game, such as a meeple sitting under a tree, you can pick up animal tiles, a quarter-circle shaped tile which can be put with others on the corner of a tile to make up a watering hole. As you’d expect, the completion and contribution towards this watering hole rewards points so while it’s easy to ignore those tiles with just a tree sitting on them, they’ll potentially bring in a few decent scores later down the line. There are a couple of other little new features too, such as the park ranger meeple which can be moved around under certain circumstances and can bring around even more of those lovely points that will push you towards victory. There’s also a three-tile-wide starter tile which gives a little more choice in terms of getting the game up and running, and it’s nice to see the developers continuing to find new ways to bring Carcassonne to the table with new ideas, tweaks and rules to give each game its own chance to stake a claim to your games shelf. But here’s the big question: do you really need another Carcassonne game? If you really love these games, play them regularly and are keen to see what else the series has to offer then you should certainly go out and gran this while you can. But if you don’t get Carcassonne out that much because the gameplay isn’t your thing then the Safari version won’t do anything to change your mind. It’s a bit different, but not enough to turn you back round onto the game. 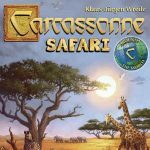 But as a standalone game Carcassonne Safari is really good fun, as we’ve come to expect from these games, so if you’re looking for a way into the Carcassonne world and like the idea of a Safari theme then this will serve you well.